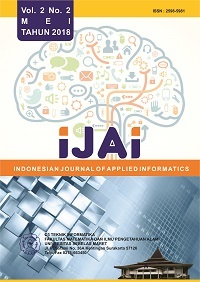 Indonesian Journal of Applied Informatics publishes articles that are of significance in their respective fields whilst also contributing to the discipline of informatics as a whole and its application. Every incoming manuscript will first be examined by the Editorial Board in accordance with sub-fields of research and attention to elements of conformity with the format and guidelines for writing Indonesian Journal of Applied Informatics. Each manuscript is declared eligible by the editor will be returned to the author (if there are repairs) or can be directly issued (if there is no revision required).